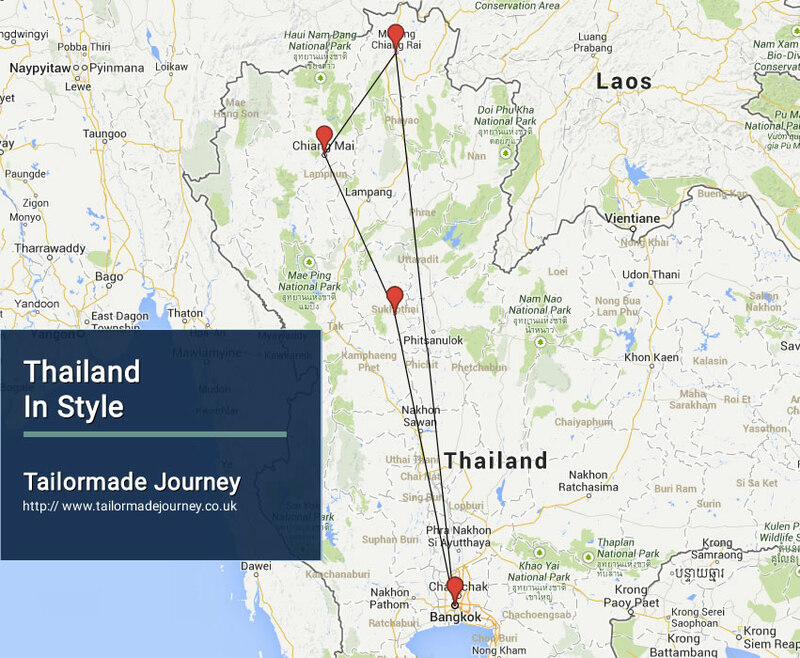 This Tour gives you a Taste of Thailand by taking you through the regions rich in Culture and Natural Attractions. Visit Bangkok the blend of Modern and Ancient Culture, Visit Local Village and Temples of Chiang Mai and towards the end of the tour Visit the Golden Triangle. Arrive Bangkok 2 Nights > Drive Uthani 1 Night > Drive Sukhothai 2 Nights > Drive Chiang Mai 3 Nights > Drive Chiang Rai 2 Nights > Flight Bangkok 1 Night & Leave. Breakfast at the hotel and we have an early start to get you to Wat Po in time to experience the monks early morning chanting ritual (chanting starts at 09.00 Hrs). After this uplifting and often private experience visit the temple grounds and the famous 45-metre reclining Buddha. Continue to The Grand Palace, Thailand’s most important landmark, where you will be awed by the grandeur and majesty of the building and its throne halls. Then, of course, marvel at the mysterious Emerald Buddha, the most revered Buddha image in Thailand. Sumptuous Thai lunch awaits you at the riverside restaurant, Supatra River House. Afternoon, we drive to Chinatown square where you start an interesting walk through one of the oldest parts of Bangkok. Walk along Yaowarat Road where you visit interesting shop selling birds’ nests and shark fins, continue to a very old teashop to enjoy a cup of Chinese tea with the locals before heading down Trok Leng Moi Eia (a small soi)to Talad Kao for an interesting local market with variety of fresh foods, fresh & dry fruits, Chinese herbs, groceries. End the walk at Wat Leng Neng Yee to visit the Taoist temple before continuing by car to Rachawong pier and board on boat for the trip along Bangkok Noi klongs (Thonburi klong tour) sampling Thai houses and Thai life along the way with stop for visit to Wat Arun. Return to hotel later afternoon. Overnight Stay at the Hotel in Uthai Thani . Overnight Stay at the Hotel in Sukhothai. Sukhothai is a name meaning dawn of happiness was founded in the 13th century and became the kingdom’s first capital, overseeing a period known as the golden age of Thai history. Visit Ramkamhaeng National museum before proceeding to Sukhothai Historical Park, see the main sites and some important ruins. In the morning, leave from the hotel and travel to a local farmhouse in Mae Rim on the outskirts of Chiang Mai where you will take a leisurely stroll around the grounds. Then board a long-tail boat and enjoy a 30 minute cruise along the rural Mae Ping River. Along the river banks you will see traditional wooden houses and modern residences. Arrive at a boat landing and walk for about 10 minutes from the landing to Waroros fresh food Market for a visit, experiencing the Northern Thai way of life. From the market you take a trishaw ride along Tapae Road past City Walls and along Rajdamnern Road to Wat Phra Singh. Afternoon, explore ancient Chiang Mai, including its old city walls, gates, moat and markets. After visiting Wat Suan Dok, where the ashes of Chiang Mai’s royal family are interred, and the historic Jed Yot temple, we drive up the mountain by “songtaew” onto a rough dirt road to the Chang Khien Coffee Research Project where you can enjoy a cup of the local ‘arabica’ surrounded by fabulous gardens of flowers. Continue to the white Hmong village of Chang Khien where the 800 inhabitants still wear their traditional hill tribe clothes and practice a culture that dates back 500 years, then end your day with Wat Prathat Doi Suthep, the temple on the mountain, and the most sacred in North Thailand. Your experienced guide will explain the story of the temple, the white elephant and lead you around its impressive chedi and show its beautiful murals. In the late afternoon, the tourist masses have already left the temple grounds and dusk will give a very special atmosphere. After your private blessing ceremony, witness the magical evening chanting of the monks. The tour ends with the spectacularly romantic evening view over Chiang Mai with its millions of glittering lights. Breakfast at the hotel. Visit Mae Sai to see the bustling Burmese border market. Continue to Sop Ruak where to see the point of the Golden Triangle where the Mekong River converges on Laos, Myanmar and Thailand. Visit the old Opium Museum, an informative museum that documents the history of the area and details its links to the opium trade. Continue to the 13th century ruined city of Chiang Saen and the heart of the Golden Triangle where the Ruak and the Mekong Rivers meet. After a walk in its temples, take a boat ride along the Mekong River to get a closer look at Laos and Burma. Return to your hotel in the late afternoon. Bangkok Today you are transferred to Bangkok International Airport to board flight for Onward Journey . Iyara Lake Hotel & Resort offers stylish rooms and free Wi-Fi in the business centre. Featuring an outdoor pool, the hotel provides free public parking on site. The hotel is a 15-minute drive to Wat Sakakrang. Wat Tha Zhung is a 20-minute ride away. Each air-conditioned room features a TV, fridge and safe. Shower facilities and bathtub are included in an en suite bathroom. Staff at the 24-hour front desk can attend to guests’ requests. Massage and laundry services are available. Legendha Sukhothai Hotel is located on the bank of Mae Rampan Canal, just 10 minutes’ walk to Sukhothai Historic Park. It offers spacious rooms with canal, temple or courtyard views. Rooms at Legendha Sukhothai have traditional Thai furnishings and teak wood furniture. Every room enjoys a private balcony and a private bathroom. Hotel Legendha provides a cooling outdoor pool, surrounded by sun loungers and deck chairs. For relaxation, massages are also available. The Legendha Hotel offers free onsite parking and bicycle rental services. It is ideally located for exploring Sukhotha Historical Park and natural surroundings.